Flights were delayed for about 30 minutes at a US airport after 150 turtles crawled on to the tarmac. 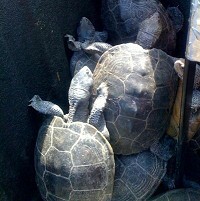 The diamondback terrapins invaded the runway of New York's John F Kennedy International Airport apparently in search of a safe place to lay their eggs. Dozens of flights were held up due to the incursion and further delays could have led to a barrage of travel insurance claims. The invasion continued for quite some time as departing flights were diverted to other runways. Even as the creatures crossed the runway to get on to the other side, workers swung into action and started removing them from across the airport space. Turtle invasion is an annual feature at the Kennedy Airport, which is located on the edge of Jamaica Bay and a federally protected park housing several animal species.